Every week in September, LRJ will feature a new blog with educational tips on prevention. These concepts are to improve your mental and physical health, while focusing on wellness and empowerment. 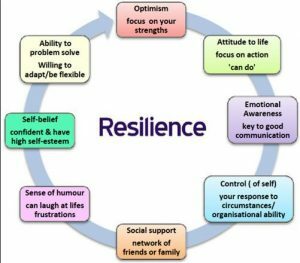 Why is building resilience important? Resilience is the process of adapting well in the face of adversity, trauma, tragedy, threats or significant sources of stress — such as family and relationship problems, serious health problems or workplace and financial stressors. It means “bouncing back” from difficult experiences. Being resilient does not mean that a person doesn’t experience difficulty or distress. According to many experts, resilience is quite common, and people are very capable of learning the skills that it takes to become more resilient. • Make realistic plans and take steps to carry them out. • A positive view of yourself and confidence in your strengths and abilities. • Good communication and problem solving skills. • Having mental strength to manage strong feelings and impulses. • Face life’s difficulties head on, overcome adversity and emerge from difficulties and come back stronger. Resilience is what gives people the emotional strength in a time of stress or hardship. It’s the strength that people are able to call on in times of need to carry them through without falling apart.